Meshi is a name that is going to stick in your mind; the latest musical helping to come from VIP Records. He is here with his brand new debut single- the track of the summer-Dil Mangdi featuring The Dark MC and Angel. Meshi is no stranger to the music scene and grew up between the UK and Singapore listening to an eclectic mix of artists. Meshi accidentally unleashed his desire to become an artist when he sang at his cousin’s wedding functions in Singapore and went down a storm! The singers musical inspirations come from legends such as Nusrat and Rahat Fateh Ali Khan, Sonu Nigam, Jassi Sidhu and Shin DCS, amongst many others. These musical maestros influence the sounds of Meshi and he then stamps his own unique mark on everything he does; both with his vocals and with his performance. Winner of the 2008 “Asian Affair” awards which was presented by Juggy D, Meshi performed live at DCS gig in Kuala Lumpur; all of this without any formal training as Meshi would practice vocals in his room with his harmonium. This was just the beginning of what was to be an immense journey- in 2011 Meshi released his own version of Surinder Shinda’s track Mirza and then in 2013 the renowned Dark MC and Angel took Meshi under their experienced wings. This meeting was a meeting like no other where Meshi sang for Dark MC in a restaurants in Southall- silencing all the other diners! After this meeting there was no looking back. 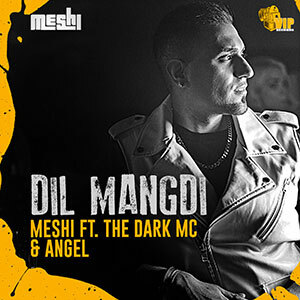 Sharing the same musical vision came naturally to Meshi, Dark MC and Angel and this is why VIP Records are proud to present the release of Meshi’s debut single Dil Mangdi. This catchy, cheerful dance track is going to be the soundtrack to your summer and is only the first helping of what is yet to come.